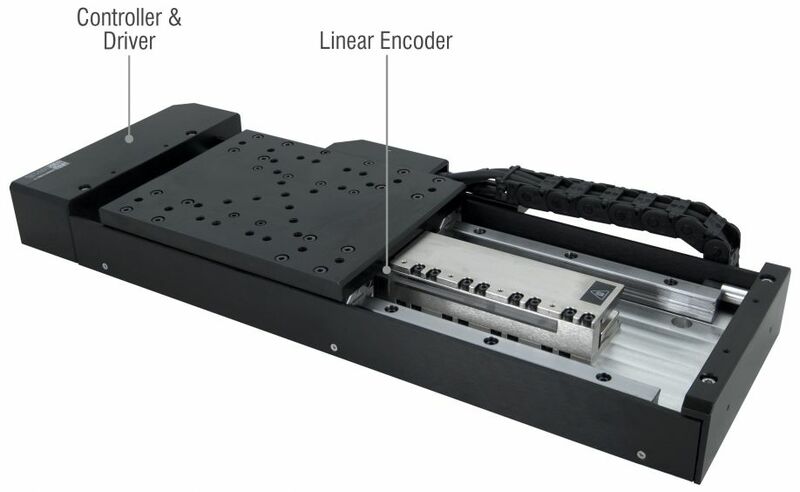 Booth #236479 - Linear Motor Stages with Built-in Controllers and Linear Encoders With the built-in controller, the X-LDQ-AE is a first of its kind - making set-up as easy as 1-2-3. At Zaber, we design and manufacture precision positioning devices that are affordable, integrated, and easy to use. Our devices are used in many different applications and markets, such as photonics and optics, life sciences, microscopy, and industrial automation. Zaber was founded in 1997 by a group of friends. Back then, precision linear actuators all used DC motors with gearbox and encoders, and they required bulky controllers and a number of other accessories and supplies. Precision motion control was expensive and difficult to set up and use. Recognizing the need for affordable and integrated solutions for motion control, Zaber released the world's first precision linear actuator with a built-in controller, the T-LA28 Series linear actuator. Based on a stepper motor instead of a combination of DC motor, gearbox, and encoder, the T-LA28 was the first device to feature all control and drive electronics in one compact package. The integration of all control and drive electronics in the same package became the foundation of Zaber's T-, A- and, later X-Series product lines. Since introducing our first series, our product offering has grown to include over 100 motion control products, which are distributed worldwide. We continue to advance our design and manufacturing capabilities, allowing us to build, test, and ship most of our products within 1-5 business days. Your company will be exhibiting at IMTS, what is it that makes this an important event for your company? Trade shows are one of the main ways that our employees are able to meet face-to-face with potential and existing customers and have the chance to show them our new products. Highlight 2 or 3 products you will be showcasing at the event? With the built-in controller, the X-LDQ-AE is a first of its kind - making set-up as easy as 1-2-3. These devices ship pre-tuned, and Zaber’s free software allows you to quickly and easily adjust the tuning parameters. These stages range from 75 – 1000 mm of travel with up to 2.5 µm accuracy over 1000 mm travel and a minimum incremental move of 50 nm, and they are capable of up to 1.5 m/s speed and 2 g acceleration. This XYZ gantry system uses the LRQ-EC series linear stages with dust covers to create a compact and protected system. Two stages are used in parallel to provide a stiff base for the system; they use the lockstep synchronization feature of the X-MCB2 to move together and feature side mounted motors to reduce the depth of the system. A VSR40A-T3 stage is used in the vertical axis to give the system a clear platform. The system is customized with tracking for cable organization. IMTS has many educational sessions & Demo’s, is your company involved in any of them this year? We will probably attend a couple. When you get a chance to walk the exhibit hall floor yourself, what is it you will be most interested to see? Any educational sessions you plan on attending? We like to see new technology and new products, especially from our OEM customers who are exhibiting. Chatting with people on the floor about the motion control challenges and applications they may have is also very interesting. We also sometimes meet with our own suppliers at these shows. We hope to meet new and existing customers. We tend to get feedback (both affirming and highlighting areas of improvement), product requests, and general ideas about how business is going. A tradeshow of this magnitude is extremely busy and stressful for the staff of exhibiting companies. Any fun things or places your team can suggest in Chicago to help unwind? We like to go to comedy shows while in Chicago. Second City is a favorite. Zaber's extensive line of computer controlled motorized linear slides, miniature linear actuators, motorized rotary stages, motorized mirror mounts, goniometers and other devices, make automating sub-micron positioning applications quick, easy, and affordable.